Patience is a very important aspect of wildlife photography that cannot be underestimated. For some reason there is always a rush to keep going, to see what else is down the road, even if there is a good subject right in front of the photographer. Well this scenario happened to me this past weekend when I was in Yellowstone. It was past six o’clock and the light was getting to that beautiful golden color. I helped it along a little bit by switching over to cloudy white balance which raised the kelvin temperature. You can see the results from yesterdays post. 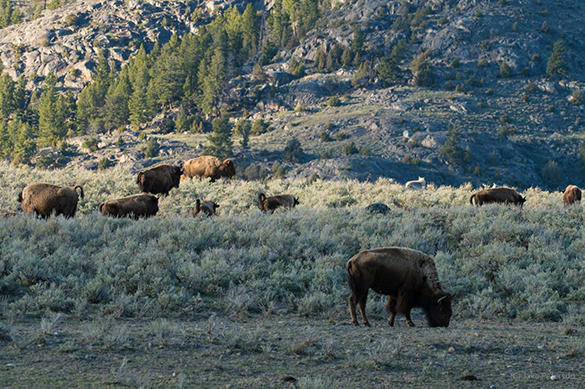 All that was around me was Bison. Everyone kept driving by except one other truck who was also shooting. Suddenly the other shooter jumped, I looked over and saw this grey blob running around and I knew it was a wolf. 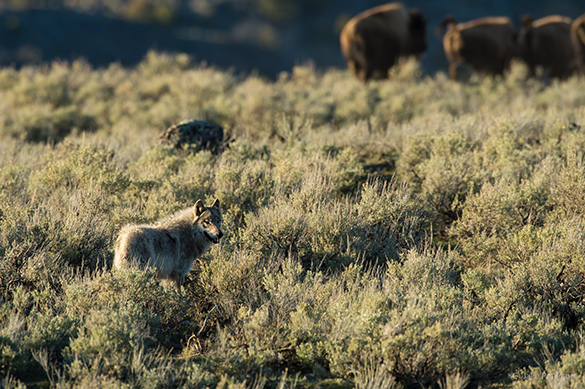 I was not expecting to see a wolf at this time of the day at this location going after Bison but in this case, one lone gray wolf was going after a Spring born Bison calf. It’s mother was being very protective and without the pack the wolf did not succeed but that didn’t stop it from trying. For over an hour the wolf and his companion entertained us. The whole time I was shooting with the D4, 600 f/4 and I was shooting a lot in high speed crop. To make the evening better the wolf decided to circle the herd of Bison that were present looking for another way to go after the calf. He couldn’t find one but he did come a lot closer to us which was great! If you ever wonder if wildlife know you are around, the answer is yes. This wolf was listening and watching us quite a lot. The whole time I was sitting in my truck shooting out the window, one more reason I didn’t use a teleconverter, low light and unstable platform but that’s what you have to do in this scenario. Now this was the interesting part. There was a coyote following and working with the wolf the whole time. 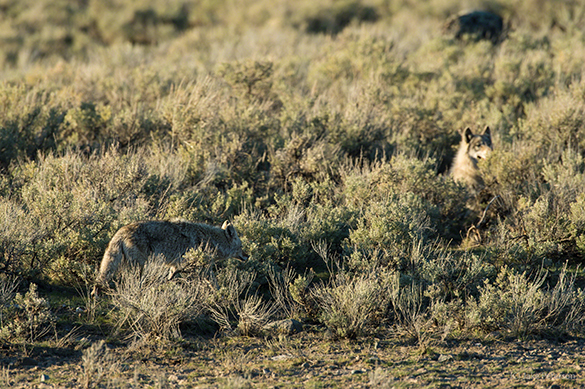 They came up the ridge together, went after the calf together and the coyote also circled around the herd. Now the wolf was probably just tolerating the coyote because it was by itself but was very interesting behavior biology to watch. All of this was because I didn’t keep going down the road. Ironically it was seconds before this happened that I was thinking about moving on. To say that luck played a role is accurate but if you aren’t out and aren’t patient then you are going to miss that opportunity and in this case the images scene here aren’t even the best, so it was a good opportunity.